Below are answers to some of the questions we are asked on a regular basis. If your question is not answered below, please consider contacting us by filling out our form found on our contact page. 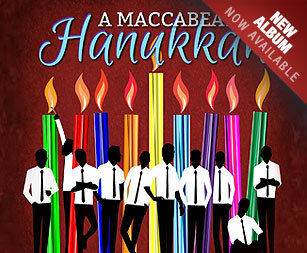 Is Maccabeats music really a cappella? Isn’t there a drum machine or some other backline? While the Maccabeats employ several different effects and techniques in both their live and recorded music, all the sounds you hear originate from the human voice. At their concerts, the Maccabeats do not lip-synch or use any pre-recorded material. How many Maccabeats are there? Do they all perform at once? 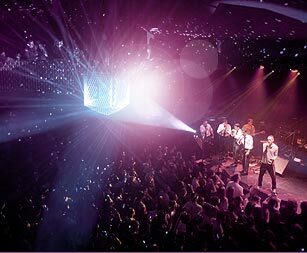 The Maccabeats have fourteen principal members, and while they all practice together at least once a week, they have only all shared the stage three or four times over the last few years. Maccabeats music is arranged in seven- or eight- part harmony, so they typically travel and perform in those numbers. How can I bring the Maccabeats to my simcha or community? 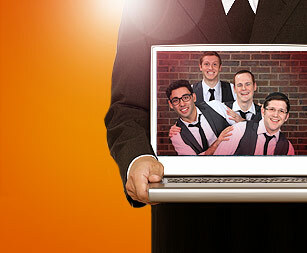 The best way to contact the Maccabeats is via email at booking@maccabeats.com. They have the best manager in the business, you will find that she’s a pleasure to work with. I’ve seen the Maccabeats in concert and on YouTube, but what can they do on Shabbat? Many would argue that the Maccabeats’ Shabbat appearances are their best and most organic. From inspiring Kabbalat Shabbat, Shacharit, and Mussaf services, beautiful background harmonies as your guests enter a room, uplifting singing at shaleshudis, and so much more, there is perhaps no better investment towards ensuring that your Shabbat is a memorable one. Aren’t the Maccabeats just a group of guys with good voices? What makes them different? Maccabeats singers spend multiple hours a week practicing together. The result – any “team” of singers that they send out to perform at your simcha is guaranteed to be of the utmost professional quality and able to deliver the most beautiful harmonies that a cappella music has to offer. How can I listen to your music? Our albums are available at Judaica stores everywhere. If your local store doesn’t stock one of our CDs, ask them to contact us! You can download our music from iTunes, Amazon MP3, and CDBaby (for our international fans). Our music is also free to stream on Spotify, Pandora, and other, similar services. Why can’t I find your holiday parodies on iTunes like the rest of your music? Without getting into too much technical/legal detail, current copyright law allows one artist to cover or parody another artist’s music for a small licensing fee, but does not allow him or her to make a derivative work from the original piece (like taking the tune and writing different words) without a special license. Since it’s not entirely clear into which of these categories our songs fall, we decided to steer clear of any legal grey areas and not offer our parody songs for sale. Are any of the Maccabeats single? Are the Maccabeats officially part of Yeshiva University? Though they are not formally attached, the Maccabeats, all alumni or current students at Yeshiva, are proudly affiliated with YU, the institution that fostered their growth from a group of guys who sung for themselves in dormitory lounges into the recording artists and international performers that they are today.